This is an incident where I didn't actually see a Sasquatch, but experienced occurrences which I had come to know as being consistent with known Sasquatch behaviour. I was walking on a nature trail through the woods behind the Uniacke Mansion Museum which went quite far back into the bush, probably over half a mile. I had my camera taking pictures of nature as I walked along the path, feeling pretty good, at one with nature while recording her beauty on camera. 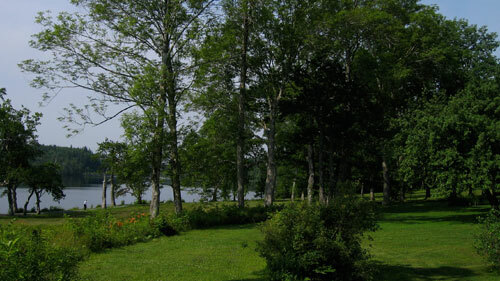 The trail was laid in a large loop leading quite deep into the woods before looping around and back toward the Uniacke House. I reached the furthest loop in the trail and was on the way back around the loop when I found a tall tree stump which I decided to stop and take pictures of because it seemed like an artsy subject. I lingered here for a while just shooting pictures and enjoying the surroundings. Suddenly I heard what I could only describe as a violent swishing of small trees or tree branches back and forth ' like SWISH-SWISH, SWISH-SWISH, SWISH-SWISH! Back and forth like only a pair of hands could grab branches and do this. It was loud enough to know that it was a large animal doing it. And, of course, it couldn't have been a moose or even a bear, since bears can't actually grasp anything, and it was followed by a very loud THUMP! like something stomping the ground with great force. A strong human could have been doing the tree swishing, but not the thump. The ground in the bush was soft and too difficult for anything but a large creature to make such an impact on the ground. It startled me when it happened the first time and I couldn't figure out what it actually was or what was causing it. I peered into the trees trying to see where it was coming from and what was doing it. It seemed to be coming from about 50 or 60 feet in, but I could see nothing. The trees and bush were thick here and easily concealed whatever was causing the disturbance. After a couple of minutes it happened again ' SWISH-SWISH, SWISH-SWISH, SWISH-SWISH! THUMP! And now, I'm thinking, ''This isn't just the wind or any freak of nature occurrence! Something is definitely, deliberately doing it!'' I started getting nervous at this point and beginning to suspect a Sasquatch. I peered even more sharply trying to find the source of the disturbance. It occurred again, this time a little louder than the previous times. I decided it was time to vacate the area and broke into a fast trot out of there. I was trying to be careful because the path and the terrain was very uneven and difficult to run on. I kept moving, looking back a couple of times, though afraid to, and seeing nothing. I kept moving, noticing that I had covered quite a lot of ground, perhaps 400 to 500 yards. Translating it to 1200 to 1500 hundred feet made it clear I had covered quite a distance. Then, about 80 feet behind me I heard a very loud THUMP! like something very large jumped through the air and stomped its feet into the ground as it landed. Knowing the distance I had covered made it very obvious that, considering the distance I'd covered, this occurred RIGHT BEHIND ME! This detail made it also frighteningly obvious, THIS THING WAS AFTER ME!! I suddenly felt panic and broke into a run ' as fast as I could go on the uneven ground, terrified and afraid to look back fearing seeing the creature and getting overwhelmed with fear. I ran and ran. I listened for signs of pursuit, but heard nothing. I just kept running, for probably 10 minutes, thinking, ''How far is it to get back?!'' I lost the path at one point and really went into a panic thinking the creature could catch me while trying to find my way! I looked frantically for the red triangles marking the path. I found the right way soon after and found after following the path a short distance, I was back at the mansion! I reasoned afterward that the creature knew how close I was, though I didn't, and broke off pursuit. I never went back for a long time and when I did, I surely didn't walk the whole trail!.